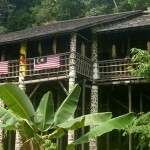 Sarawak’s oldest national park was established in 1957, covers a modest 27 sq. 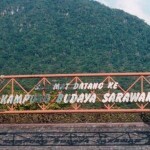 km., and is about 37km from Kuching. It’s known for its extraordinary natural scenery, habitats, plants and wild life. Its most significant features are secluded coves and rugged rocky headlands with magnificent steep cliffs that overlook the South China Sea. The sea spray, wave action and the wind have also carved out magnificent sea arches and sea stacks at the base of the cliffs, some rearing above the waves like a mighty serpent’s head. The attractive sandstone formations appear pink with iron patterns on the cliff. Further inland, waterfalls tumble down into freshwater pools in a tranquil and idyllic jungle setting. Bako contains an incredible variety of plant species and vegetation types, and this is one of the parks great attractions. 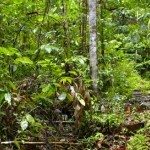 At Bako it is possible to see almost every type of vegetation found in Borneo. Bako is also home to approximately 275 rare proboscis monkeys, found only in Borneo. The best times for seeing wildlife at Bako are just after dawn and just before dusk, when the animals are at their most active. Bako is a fascinating place for bird watching, as over 150 species have been recorded here. Bakos extensive trail system is made up of 16 colour-coded jungle trails which offer a range of walking and hiking options. The fit and adventurous can opt for full- day jungle hikes or overnight camping expeditions, whilst those who prefer to take it easy can opt for a relaxing forest walk. Copyright @ 2014 AT Global One Assist.